Hue is that attribute of a color by which we distinguish red from green, blue from yellow, etc. There is a natural order of hues: red, yellow, green, blue, purple. One can mix paints of adjacent colors in this series and obtain a continuous variation from one to the other. For example, red and yellow may be mixed in any proportion to obtain all the hues red through orange to yellow. The same is said of yellow and green, green and blue, blue and purple, and purple and red. This series returns to the starting point, so it can be arranged around a circle. 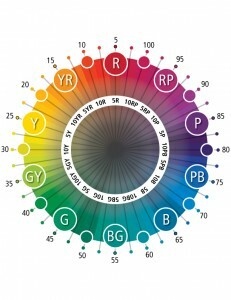 Munsell called red, yellow, green, blue, and purple “principal hues” and placed them at equal intervals around a circle. He inserted five intermediate hues: yellow-red, green-yellow, blue-green, purple-blue and red-purple, making ten hues in all. For simplicity, he used the initials as symbols to designate the ten hue sectors: R, YR, Y, GY, G, BG, B, PB, P, and RP.